Michigan derives its name from the French translation of the Chippewa, or Ojibwe, Native American word “mishigamaa” which means “great water”. 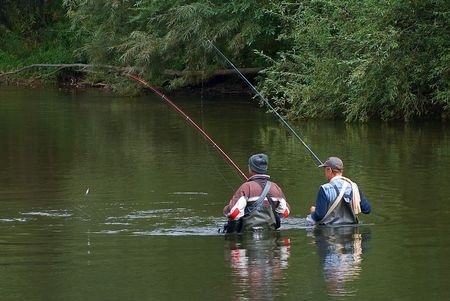 Surrounded by 4 of the 5 Great Lakes (Lakes Erie, Huron, Michigan and Superior) and containing thousands of smaller bodies of water, Michigan is truly the big water state and arguably one of the best freshwater fishing destinations in the world. The state sports one of the most diverse fishing experiences that can be found all in one state. There are a number of great locations for fishing in Michigan starting with the Great Lakes with its numerous opportunities to catch fish such as Atlantic and Coho Salmon, Chinook, Brown and Lake Trout, Walleye, Yellow Perch and many other species. It’s little wonder that tens of thousands of people converge on the Great Lakes annually during fishing season. There can be no conversation about Michigan fishing without first mentioning the Great Lakes. These waters represent the largest uninterrupted body of freshwater in the world and are home to more than a 100 species of fish. Michigan has access to them all including 3 varieties of Salmon (Coho, Atlantic & Chinook/King Salmon), Lake Trout, Brown Trout, Steelhead, Walleye, Perch and too many others to name. Commercial and sport fishing on the Great Lakes is said to bring in over $4 billion annually to the region. Lake Michigan charter fishing, as popular as ever, certainly helps contribute to the sport as well as to the regional economy. popular with the locals and has developed a larger reputation for those who love catching large and small mouth bass. Bass season begins at the end of May and Cass Lake is the perfect place to catch them from a boat or the shoreline. Hamlin Lake: Near the Western Coast of the lower peninsula, Hamlin Lake is perfect for winter fishing thanks to its 5,000 acre lake that is brimming with crappie, bass, perch, walleyes and the northern pike. You can also enjoy other opportunities such as ice skating and cross country skiing in the region during the winter and excellent fishing opportunities in the summer as well. Lake St. Clair: Located just north of Detroit, Lake St. Clair is routinely named as one of the best fishing lakes in Michigan. Plenty of muskie fishing can be had in this lake, particularly in the summer months along with perch, walleye, and bass. These are but a fraction of the outstanding fishing lakes in Michigan.There are of course plenty of other lakes, rivers and smaller bodies of water in Michigan that offer numerous types of prized fish. There are many types of fish that anglers want to catch the year round in Michigan and the surrounding Great Lakes. However, some of the most prized types of fish species are those that provide a good challenge when it comes to catching and, for some, those that provide tasty food value. Atlantic Salmon: This feisty fish is one that is well known for its fighting and leaping abilities. Transplanted to the Great Lakes, the Atlantic Salmon begins their spawning in the mid-summer months which is a great time to try and catch them. Lake Michigan Salmon fishing is a top activity in the state. Long known for its delicious taste and nutritional value, this fish is an angler favorite. Great Lakes Whitefish: A tasty treat for those who love fish, the whitefish is one of the staples of the Great Lakes region and Michigan is in a prime spot for anglers to catch this remarkable fish. Michigan Steelhead: The Steelhead is another good game fish that is found in the freshwater areas that displays great fighting and acrobatic abilities. The fantastic display of its areal abilities is just one reason why this particular fish is so popular. Other popular fish include Chinook, Walleye, Perch and many more which are found in the many smaller lakes, rivers and ponds of Michigan as well as the Great Lakes. For those who are looking for great fishing opportunities, Michigan is a wonderful state whether you enjoy fishing out on the Great Lakes or finding that hidden spot among the many smaller bodies of water that this state has to offer. Michigan fishing charters and guides will make your trip both fun and productive.